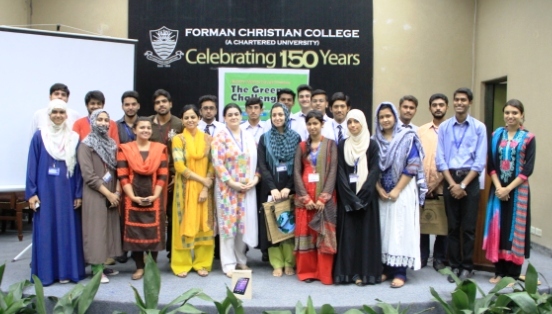 The Earth Watch Club held a quiz competition, the Green Challenge on 17 and 18 September 2014 for FCC’s students. The purpose of the event was to create awareness among the students regarding their environment. The event consisted of two rounds. Approximately 225 participants were a part of this competition. Mahira Gulzar got the first position. 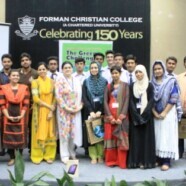 Abdullah Shah Islam, Iqra Hanif, Zunaira Rafique, Momeer Rafaqat, Arsalan Ahmad Chattha, Shafqat S. Nasir, ArsalanFarooq, Nimra Raffique, S Maham, Saddam Hussain, Mussawir Abrar, M Hassan Malik, Azeem Muzammal Subhani, and M Hanif Khan were among the top participants. Ms Sylvia Machado from the Environmental Sciences Department was the Chief Guest and distributed gifts and certificates of participation among the top scoring participants.